Give him a hand, ladies and gentlemen! 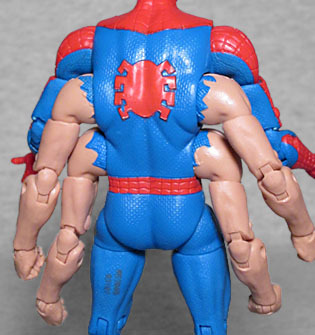 Hoping to cure his spider-powers, Peter Parker drinks a special mixture and wakes up with four extra arms. 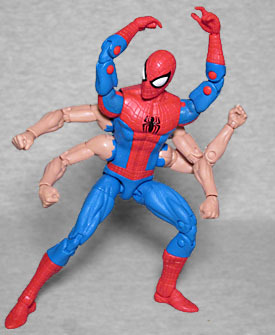 "Six-Armed Spider-Man" is one of the most famous bits of weirdness to ever happen to the character, getting adapted to cartoons, videogames, and even other comics mainly on the strength of its wild and memorable design, but it's also a fairly momentous story for real-world reasons: Amazing Spider-Man #100, where the extra arms first appeared, was Stan Lee's final issue; on his way out the door, Stan was like "here, have fun with this! ", leaving the situation to be resolved by incoming writer Roy Thomas. It may surprise you to learn this figure reuses existing molds. It's not immediately apparent, but once you notice his webs are sculpted in rather than being painted, and the texture covering the blue areas of his costume, you may start thinking back to all the other Spideys we've had over the years, and you may realize his head, (top) arms, and legs all come from ASM2 Spider-Man! The torso is new, as it would have to be. The mold is done to match the existing pieces, with etched-in webs and the small pattern on the rest. 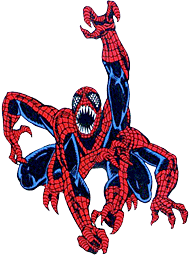 The spider symbols on his chest and back are raised elements as well. The four arms bursting from his ribs are bare skin, but the little shreds of costume on the shoulders have the source details, too. This has all been executed quite well, and shows a lot of care for something that is basically a gag figure. The whole thing could be improved by painting the webs, because they're hard to see unless the lighting conditions are right. The new arms have just as much articulation as the pre-existing ones did: swivel/hinge shoulders, swivel biceps, double-hinged elbows, and swivel/hinge wrists. Due to the way the torso is made, there are no waist or chest joints of any sort - you'll have to be content with all the highly poseable arms. Spidey has no accessories, not even a piece of this series' Kingpin Build-A-Figure. It's just him and his arms in the middle of the tray, because there's not really anything that would make sense for him, is there? Well, maybe they could have thrown in some alternate arms and a repainted Spider-Carnage head so we could turn the figure into Doppelganger, but that probably would have been too expensive. An issue of Marvel's What If--? comic examined what might have happened had Peter not been able to cure himself of these extra appendages. Considering that most What If--? stories ended in tragedy, irony, or ironic tragedy, that one was super positive: he eventually gets used to the extra arms, which gives him an edge in combat, and the public likes him better. A rare happy ending! 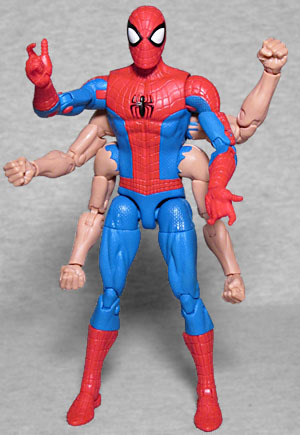 ToyBiz once made a six-armed Spider-Man figure, but that was ages ago, so this one is vastly superior.